I bought a new silicone bundt cake and of course flipped in this book for a recipe to try. The very first one "Brown Sugar Bundt Cake" caught my eye (brown sugar, hazelnuts, prunes... ) so I gave it a try. I did sub apples for pears but other than that I followed the recipe. Well, the end result was deliciouse, the brown sugar and hazelnuts really came through, with a perfect texture that is light and fluffy. The problem is I followed the instruction that said not to butter/flour the pan if using silicone! Yeah right! The cake stuck and my bundt was stripped of all its "crust" . Maybe no buttering and flouring is needed for simple silicone shapes, but a bundt pan with all the grooves needs it. The cake was very ugly (hence, no pics) but so tasty that I am hoping to make it again, this time I will butter and flour my pan though. I also made Rugulachs for breakfast. Yes they are a cookie..technically...but They go so great with a good cup of coffee. These worked perfectly, but I like them more when they are room temperature as opposed to hot from the oven. Something about the pungency of the flavors works better when tamed after cooling. Once cool these are addictive. This is a gingerbread to serve to people (like my husband) who think they don't care for gingerbread. He's now converted. As I was making the gingerbread I realized that one of the special things about this book is that Dorie anticipates just when you think you might have gone off the rails. OK- the batter has curdled, but that's just fine. The cake might raise and crack in the middle but will settle back down as it cools- check. You can trim off the edges if they're over-browned -yup. This is all so reassuring. Just as if she's standing over your shoulder. Now, the one thing I'd like to add to my next go with this is some toasted black walnuts. I'll have to see if the squirrels left me any. PS: I just decided to treat myself to a gift of a madeiline pan. It'll be the Earl Grey Madeilines as soon as it comes. I made my first ever batch of rugelach tonight. I've never wanted a digital camera before tonight because these are gorgeous. The recipe was very easy to follow. Because of the warm weather, I had to put the dough back in the fridge a few times. I also left out the chocolate because I didn't realize I didn't have any in the house. I always preferred the chocolate rugelach from the neighborhood bakery but these could turn me around to fruit and nut. Light, flaky crust with the right blend of sweet and tangy. I will definitely be making another batch soon with a chocolate filling. Just need to stop baking long enough to pack up my apartment in time to move in two weeks. This book is making that very, very difficult! As a comparison, I made a batch using bubbe's recipe (modernized by my cousin). I like Dorie's crust better as it was lighter and flakier with equal parts butter and cream cheese. The family recipe had more butter. The family recipe had more filling and yielded bigger rugelach. I like the additional filling. Next batch will be Dorie's crust with bubbe's filling proportion. Oh man! I made the Cardamom Crumb cake yesterday, I finished the last piece for breakfast this morning. I have been kind of obsessed with cardamom lately, so I was excited. It was so interesting and delicious. The combo of strong orange, mild cardamom, and a background of espresso was perfect. The crumb topping was fantastic, the cake was just mildly sweet, so the topping really set it off . I ate almost the whole thing myself. Has anyone tried the pecan pie? I made the World Peace cookies today. I had the in-retrospect-not-terribly-good idea to shape the logs into triangles because my round icebox cookies often get a flat side from the slicing. I ended up with vaguely triangle-shaped blobs of deliciousness, but I don't really mind. They are the perfect thing with coffee. I also made the World Peace Cookies today for slicing and cooking tomorrow. Also made the Holiday Cake. Smelled wonderful but can't slice until a party Friday night. Dorie is everywhere! It's great to see the book is so popular. 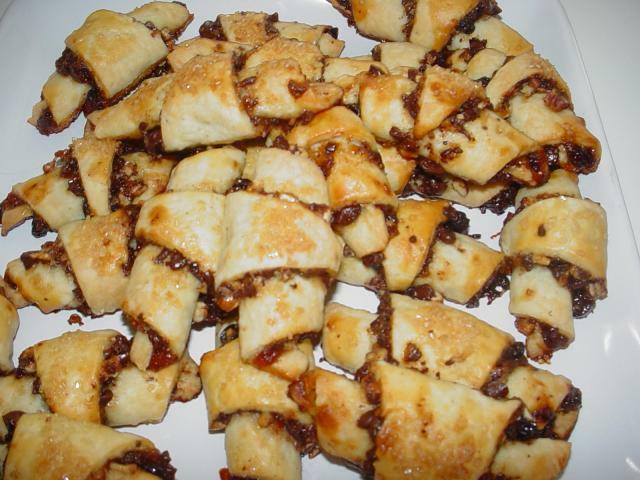 On NPR with rugelach recipe. In the LATimes with a Chocolate Chestnut Torte. Personally, I have my eye on the Far Breton. I just got the book, but haven't had the chance to make anything from it. However, I went out of town for a couple of days, and left it with some friends who loved the pictures. I was thrilled to come home and find that they had made the white out cake! It is a very good cake - Looking at the picture, I didn't expect to like it, thinking it was just a cocoa cake with a plain frosting. But it was great! The cake has lots of real chocolate and a great combination of textures, with which the frosting went excellently. And I am always excited to see my friends scratch baking. We started baking together a few months ago, generally making two recipes - my choice and theirs, so, generally, it would be something from CDWPH and a cookie recipe. This is the first time they've really baked alone though - they told me that they had to go out and buy cake pans, and they used a meat thermometer for the frosting. Anyway, thanks Dorie, for putting so much great, uncompromised baking from scratch into this book with your always clear writing, it's exactly what people need to encourage them. As for me, I'm currently very interested in chestnuts, so I've been eyeing all of the recipes in the book. I'm thinking the Chocolate Chestnut Torte, as well as the chestnut muffins, since I just picked up some chestnut flour. I roasted and peeled a pound of chestnuts today (for a chestnut soup), but it was painful. Lots of them were moldy too. Does anyone else peel their own chestnuts, and have any suggestions? I don't recall seeing any posting on the Chocolate Caramel Chestnut Cake I am considering taking to my DIL's Xmas dinner. If anyone has tried it, could you please comment. I won't have time for do-overs. --First, did your family, guests, you like it? Would you make it again? On request from others? --Second, any tricky bits in the making? --Third, do you think using marron glaces in place of the jarred chestnuts would be better or worse than the plain jarred chestnuts? Sweetness overkill? I'm making more than one cake, so if everyone isn't enthusiastic about chestnuts, there will be something else for them. The only chestnut cake I've made was a simple not very sweet one from Julia della Croce's Veneto. It was essentially a nut cake, using chestnuts instead of flour and unadorned but for a dusting of confectioners. I loved it, but my family was not impressed. I think Dorie's considerably more festive cake would appeal to them. Who could resist all that chocolate? And coincidentally I bought a kilo bar of milk chocolate and a bag of semisweet feves recently (both Valrhona Guanaja). Took the All in one Holiday Bundt Cake to a party this evening. Not a crumb left and so many people remarked on how delicious it was. Also brought the World Peace Cookies, and Peanut Butter Chocolate Chip Cookies. They were all winners!! I've been meaning to bake these for weeks. I just finished baking the My Best Chocolate Chip Cookies recipes and I'm in love. These are the best chocolate chip cookies I've ever made. I'm going to make more to bring to Christmas dinner on Monday. They taste wonderful and I love the sheen. I'm also going to try baking them with adding a little preserved rose petal and see how that comes out. Got snowed in this morning, so the Orange Berry Muffins are in the oven. The house is smelling wonderful. The advice to rub the zest and sugar together to release the oils was great. Once I read it, it was so incredibly obvious, but I had never done it, or even thought of it, before. I love learning another new tip. Mott Mott--Please do tell how your chestnut cake comes out and what you discover. I haven't done much with chestnuts and am curious. I made the orange berry muffins again today. Getting the recipe right this time? Made all the difference in the world. They're delicious. I'll definitely be making these regularly. I also used a different brand of blueberries (I prefer them small & tart – the ones I used last time were large & sweet). I'll have to make a note of that. Dorie will be happy to hear that the pages of my book are already sticking together. And I'm contributing dessert for tonight's Christmas dinner, so I made the sour cream swirl bundt. I made the chocolate muffins. They are absolutely gorgeous but I finally understand people's comments about tasting baking powder in the final product. I never got that before. They rose very nicely so could probably easily handle less baking powder. I'll cut back and try again as they have a light texture but very chocolatey flavor. Well, I did my stint with shortbread cookies this past weekend. I made the butter pecan ones but added too much cloves. It over-powered everything else but they are good if you like cloves. Then espresso chocolate which I decided are the best of the bunch and lastly some lavender ones from recipe gullet for a friend for xmas. he's sick so they haven't been given yet. I loved the ease of putting the dough into a gallon plastic bag and then rolling it. It certainly limited the mess factor. I got lazy in the end and used a ruler and pizza wheel to cut the dough into squares for baking. Next will be thumprints with all the jars of homemade jams I received as gifts. I made the Chestnut Caramel Cake for Christmas. Everybody really loved it (though it is still far from being done, it is huge). The chestnut flavor in the cake really came through. It's dense but good, and the syrup makes it moist (no evident brandy flavor). The ganache is pretty much the chocolate caramel one from CDBPH, except the caramel is infused with cinnamon, it remains one of my favorite frostings. The chestnuts between the layers are a nice touch, texture wise and flavorwise, but I think this is a time to use freshly roasted ones. I used bottled, but they seemed not far from mushy. My ganache for the glaze on top broke, I don't think that's happened for more than a year. It also seemed a bit thick. However, really a wonderful cake, and although there are three components, they are all pretty much standards, nothing complicated. I highly suggest it. Just reporting that everyone loved the chocolate swirl sour cream bundt that I made for Christmas dinner. As stuffed as we all were after dinner, everyone had to have a big piece of cake, and it was a popular choice for the leftover packages. I even got emails the next day saying how much it was enjoyed with coffee the next morning. Thanks Dorie! Today I made the Molasses Spice Cookies (I omitted the pepper as I wanted to share with a grandchild and thought it might be over the top for her!) but they are crispy and good. I also made the Brownie Buttons but had some problem with them sticking to the muffin pan - guess I didn't butter them quite enough. I did not top them with white chocolate by choice. I know for most people there's no such thing as too much ganache, so take my remarks with my bias in mind. I also made the Chestnut Caramel Chocolate cake for Christmas. My reaction was that I'd have enjoyed it more if someone else made it. I thought it was not special enough to justify the amount of work or expense or the calorie/cholesterol count. (It was $35 just for the jarred chestnuts, puree, and Valhrona chocolate, though to be fair, I still have a lot of jarred chestnuts left to use up.) I used bottled chestnuts from WmsSonoma and didn't find them mushy, just not exciting. Roasted might have been better flavor, too. I wanted to get marrons glacee, but couldn't find any locally. I think they would have been a nice touch. Part of the problem is that I didn't like the heavy ratio of ganache/glaze to the cake, despite my having used less than the recipe calls for. As I tasted the individual components, they were all fine. If I make this again, I think I'll use much thinner layers of ganache. It overpowered the cake so that one hardly tasted it. I think I might try the cake in a larger pan to get a thinner cake and either glaze it in one layer or perhaps 2, skipping the ganache. I only bought this book recently, but have already made the All-in-One Holiday Bundt cake twice (fabulous!) & today am making the World Peace Cookies for the second time in three days - they are incredible. I am a baker from way back, but it's been a long time since I've read a baking book cover to cover. I think I will try the Cardamom Crumb Cake next - it looks wonderful. I made the cranberry upside-downer for Christmas. What a great dessert - easy to make, looks and tastes great. 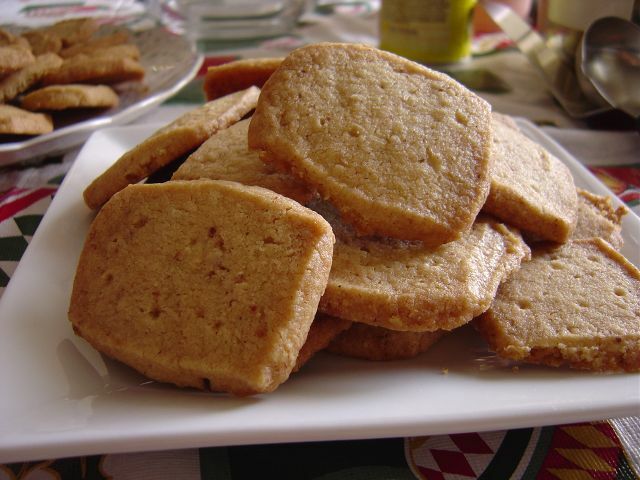 Today I made the Brown Sugar-Pecan Shortbread Cookies. The recipe was flawless as far as directions and the cookies got thumbs up from 3 out of 4 tasters. One person said that they were too sweet but it's hard to please all of the people all of the time. I must say thanks to Dorie - I think I have done more baking since getting this book than I have in most of my life! There is just something about it that inspires confidence that things will work.